With every passing day I realize more and more that fashion for me is quite therapeutic. All my downs can be converted into ups by simple retail therapy as first option but if that’s not possible, just fashion intake in any form. I remember while growing up, whenever I would stay up the entire night studying right before my exams, if at around 3 am, I was really bored of studying or very sleepy, I would get up and go to the mirror and put on some really creative makeup. I would spend 15 mins experimenting, get really really freaking happy that I looked pretty at 3am [still in my pjs] and once satisfied by my makeup achievement, I would go back to studying with my makeup on. See what I mean by fashion in any form is therapeutic. The only down side of it was the minor heart attack my father would have every time he entered my room at 4.30 am to check on me in his sleep….lol… poor pappa! I had the best weekend with an old friend…didn’t even need makeup to brighten up my day !! Love them rings and shoes! I'm not such a big fan of the harem trouser, but they do look good on you! Mm pretty clothes and shopping always lift my spirits. I find my spirits need lifting too often though and then my wallet doesn't feel so happy. Really liked the second pic... and me want to borrow that necklace! Really Love your pants...they are fab! I love the neck-piece and the wedges. Killer!! I love this necklace with the harem pants! 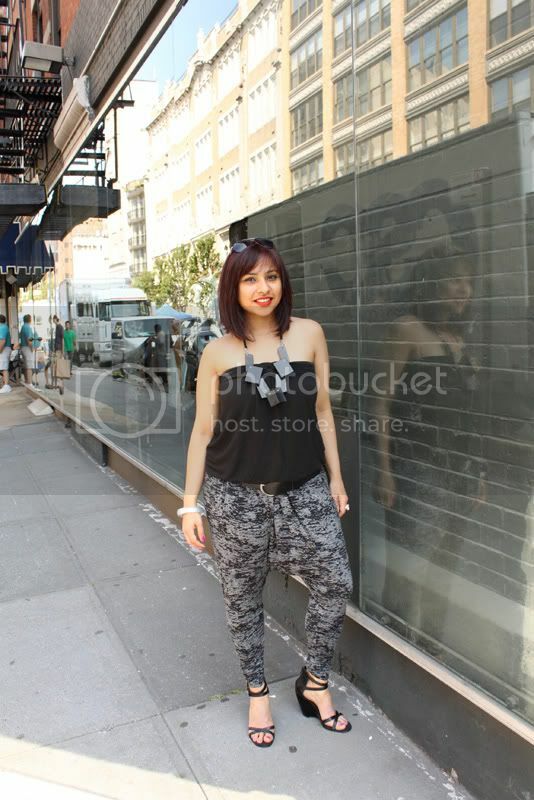 Love this herem pants and the necklace! I have missed out on so much of your blog. You make NY look so good! And you really have an eye for the craziest people. As for this post, those are some crazy pants lady! I'm guessing the necklace is a symbol of the architect in you. Anyhow it's a real treat to the eye. Prutha, I adore your spirit! The design detail on your top is fabulous!! I am having a giveaway on my site! I really, really adore that outfit! Even if I'm not leaving the house I have to paint my face, it makes me feel so much more creative. Thanks for popping by, you have a great blog. great that u have something to relex u! i love ur accessories for this outfit! you should check out persona (www.personaworld.com) for some of their european charm bracelets. very chic. also loving ur hair color here. So in love w/ your harem pants & I love your hair color! I love your outfit. I want this necklace.